The Australian College of Nursing has always been a proud supporter and advocator for equality for all regardless of gender, age, race, sexual orientation, cultural background, religious beliefs, income, education or where they choose to live. For International Women’s Day this year, the staff at ACN decided to put our words into action and team up with a worthy cause that aligns with our objectives – so we decided on Share the Dignity. 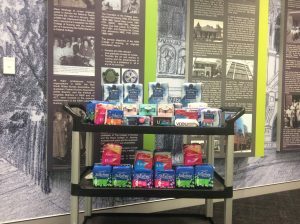 The national charity collects personal hygiene products, including pads and tampons, for women experiencing homelessness and poverty, as well as helping to fund funerals for victims of domestic violence and campaign for justice for Australian women. Sharron Smyth-Demmon, one of ACN’s Sydney nurse educators, helmed ACN’s involvement in the project and said she was inspired to reach out after reading about Sali Hughes – a beauty writer in the UK – and the work she was doing. “She’s involved with a campaign that organises donations of toiletries and sanitary items for food banks to help women in need. I thought that there would be something similar here and I discovered Share the Dignity, a charity for women in crisis. Menstruation affects many women. Vulnerable women have to make choices that most of us don’t. We choose what to buy for lunch. They may have to choose whether or not to buy food or sanitary items. That’s not a choice they should have to make. Imagine how that would make you feel, what that would do to your self-esteem, how that would limit your daily activities, how you would do your laundry, even – there’s no dignity in that. – On average, one woman a week is killed by a current or former partner. We are proud to support such an important initiative that believes no woman should have to choose between buying food or sanitary products.